Good morning, readers! It’s time for another Digit-al Dozen week and this month’s prompt is Negative Space. I haven’t done a ton of negative space manis in the past, so this week will be a real challenge for me. I’m not a huge fan of showing bare nail tips under nail art, so we will see how this week goes. For today’s mani, I chose to make floral stamping decals with my ÜberChic ÜberMat and then add another stamped image behind them for even more coverage of my bare nails. There is so much going on with the decals that I am not overwhelmed with bare nail showing. I used 6 of the new KBShimmer Fall 2016 Collection shades for this look, which release this Friday! I began with a coat of base coat on the finger spots of my UberMat and let it dry. Once it was dry, I used Mundo de Uñas Black stamping polish to stamp the floral image from UberChic Stamping Plate 3-01 onto the mat. 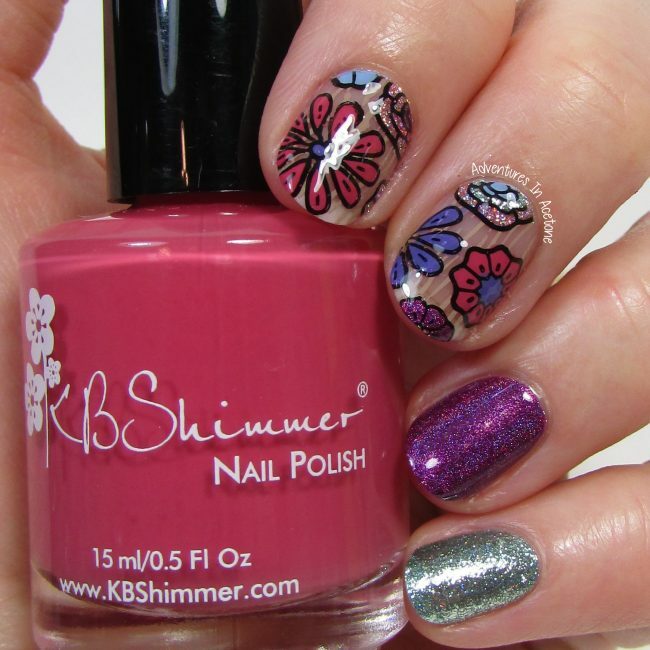 I used a thin art brush to fill in the florals with KBShimmer Grin and Gerbera It, KBShimmer Turning Pointe, KBShimmer Flake Me Home Tonight, KBShimmer Little Boy Hue, KBShimmer Orchidding Me?, and KBShimmer The Best Mum Ever. Once they were dry, I used Mundo de Uñas Taupe stamping polish to stamp a line image from UberChic Stamping Plate 8-01 over the florals. When I peeled up the decals, this became the background image. I painted my index and middle fingers with a base coat and applied the decals to the tacky polish before it dried. My ring finger was painted with two coats of KBShimmer Orchidding Me? My pinky was painted with two coats of KBShimmer Flake Me Home Tonight. I topped all of my nails with KBShimmer Clearly on Top. 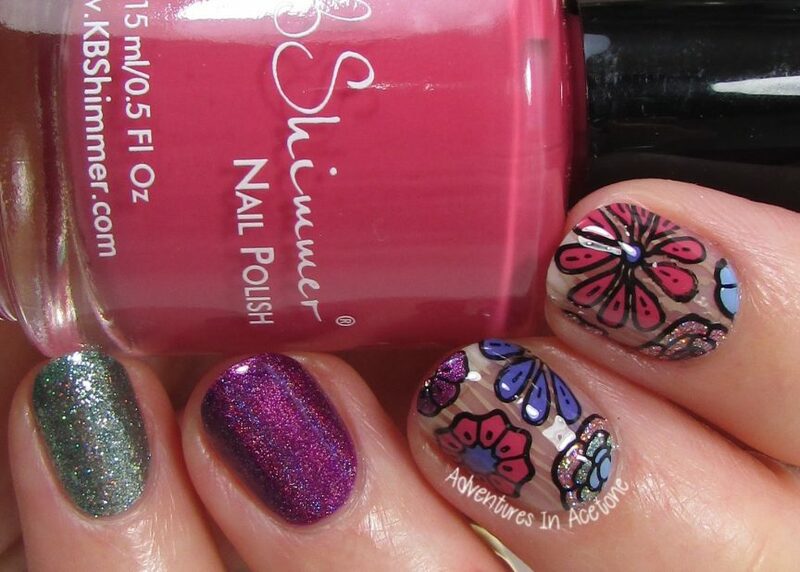 Ooh this mani is so fun & makes me think of something you’d wear to a hippie festival. The colours are beautiful. Your decals are so perfect! These are super cute! That stamp is adorable!